This is the view I awoke to the morning after I arrived. 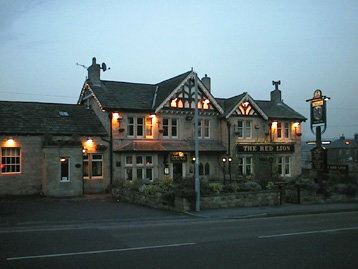 This is near a little town called Burley, about a 20 minute train ride north of Leeds. I will staying here for a few more days until I find accomodation a little closer to the Hospital. This is my first trip into Leeds itself. 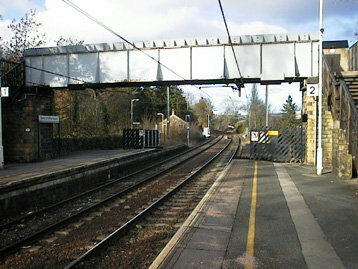 On the left is the train station near where I am staying (about a 35 minute walk away). On the right is Leeds Town Hall. I will try and see if I can go inside in the next few days. 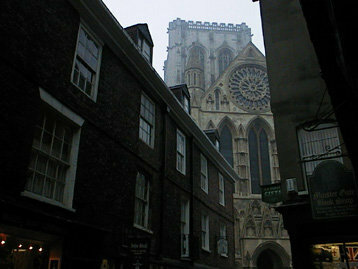 Today I travelled to York, which is about a half an hours train ride to the east of Leeds. 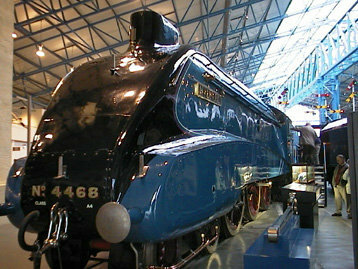 After arriving at the railway station I went straight to the National Railway Museum. They had some amazing trains and carriages there. 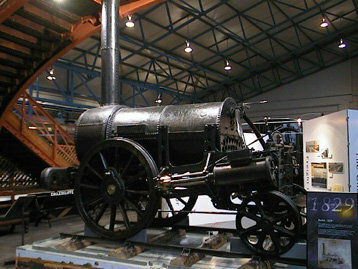 Pictured on the left is the real Stephenson's Rocket and on the right is the Mallard, which still holds the record for the fastest steam locomotive - achieved in 1938 at a speed of 126 miles per hour. 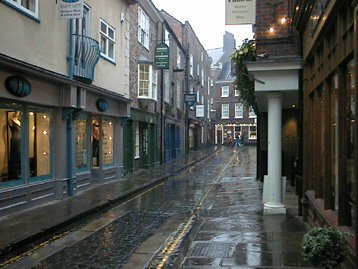 After the Railway Museum I walk around the streets of York for a while - the fine weather was certainly shortlived! Then I visited the Jorvik Viking Centre (Jorvik is what York was called after the Vikings captured it in the 9th century) which showed what the area was like in the times when York was a major trade centre for the Vikings. Unfortunately I couldn't take photos in the centre. 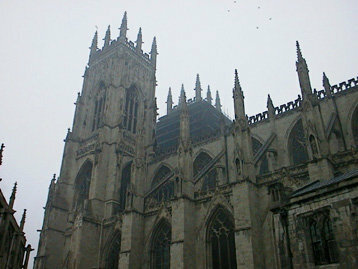 After that I visited the beautiful York Minster (pictured right and below). Spectacular Gothic architecture dating back to the mid 13th century really makes York Minster stand out from everything else within miles (it can be seen for miles towering over York). 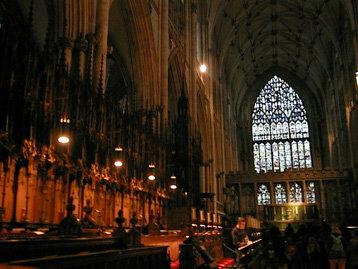 It contains some of the largest stained glass windows in the world, the largest of which took three years to complete (pictured right). 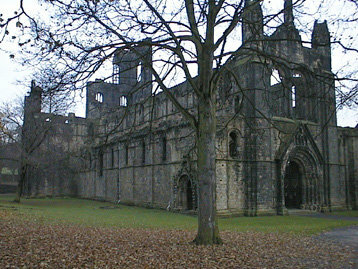 Founded in 1152, Kirkstall Abbey was a place of Monastic worship and work for 400 years. 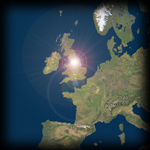 It was surrendered to Henry VIII's Commissioners in 1539. 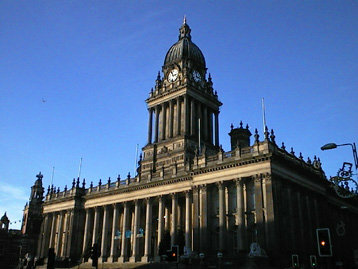 250 years later, in 1889, it was presented to the City of Leeds. 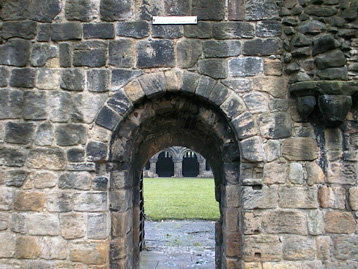 It is one of many, many Abbey ruins in the area. After visiting the Abbey ruins I ventured off to Jimmy's to have a look around and introduce myself to the staff in the A&E Department, which is where I'll be doing my elective. I have been told that Jimmy's is one of largest hospitals in the UK and Europe - I'm not sure of the figures, though. The panorama at the top is the view of Jimmy's from the main entrance. 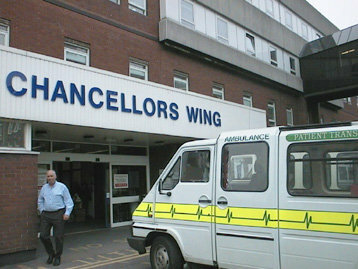 Chancellors wing, where A&E is situated, is the building to the far left of the picture. Combining the panorama image with sophisticated digital enhancment technology (the kind they use in movies to covert a smudge on film into a clear number plate) I have managed to zoom in on Chancellors wing (pictured below). I can't believe it actually works - it even manages to 'cut through' trees! This is what I was faced with whilst waiting for the bus home from Burley in Wharfedale. Needless to say I didn't stand around in the 3 degrees for long. I did miss a few buses, though.